Time now for a look at some titles coming our way in July courtesy of BBC Worldwide, and it's a Tamsin Greig-a-thon! Well, if two releases featuring the actress could be considered that? Still, you probably already have Green Wing and Black Books lying around already so pull those off the shelf and make it so. 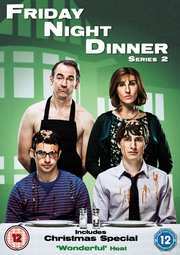 First up on 7th July is the DVD and download release of Friday Night Dinner: Series 2, coming with a recommended retail price of £20.42. Also available on the same date will be a box set containing this and the first series priced at £25.52, whilst the third is scheduled to air on Channel 4 a few days before this release. This co-stars Simon Bird, Tom Rosenthal, Paul Ritter and Mark Heap. And it also includes the Christmas special episode, if you were wondering. Things get even odder in the Goodman household. Each week twenty-something brothers Adam and Jonny go back to Mum and Dad’s house for Friday night dinner, and each week Mum and Dad get ready for an evening of domestic squabbling, food-related pranking and lashings of ‘crimble crumble’. In this series, Adam goes out with a girl who smells like Mum and Jonny gets a girlfriend who’s twice his age. Meanwhile, Dad dries fish in the downstairs cupboard, Mum is forced out the house by a mouse, neighbour Jim makes a birthday cake for his dog, Grandma gets a new boyfriend who tries to fight Dad and we meet Dad’s mother. 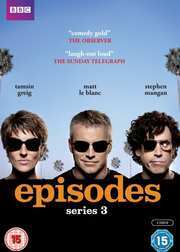 Following one week later on 14th July is Episodes: Series 3, co-starring Steve Mangan and Matt Le Blanc. This one comes with an RRP of £14.99. Sean and Beverly are back together. But they soon discover that it’s not so easy to heal old wounds, especially when additional secrets are revealed about their time apart. Things get no easier for Matt Le Blanc this year, as his career and ego continue to be pummelled. Even though Jamie Lapidus has left her husband for him, Matt still has a wandering eye (and other body parts), putting the one good thing in his life in jeopardy. The situation at Pucks! goes from bad to worse as the ratings continue to plummet. A new head of the network is eager to cancel it altogether. Everyone must scramble to figure out what they’re going to do next. Even as Pucks! stubbornly refuses to die.